This flower was put up over a year ago! It is south facing with no shade, so it gets a lot of sun. It's faded, but I think it still brings smiles to the neighborhood. The new ones use better wire for the leaves. 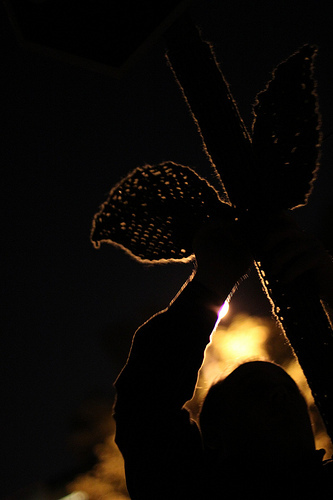 He was very nice, and said the city's hands were tied and they tried to find a way to keep them -- but they have to go. Save the flowers! Councilmember Lorie Zapf is collecting emails of support at loriezapf@sandiego.gov to show community backing and find a way to keep them in Clairemont. Send her your story, and let her know how much you like them! Wow! All 100 have been planted! Thank you to all the knitters and planters that helped! Check the flower map for one near you. Only 15 to go! Check out the map to find one near you! Channel 5 ran a piece on the project, watch it here. I also heard it was on KUSI, but I didn't see it. If anyone has a link, please send it! 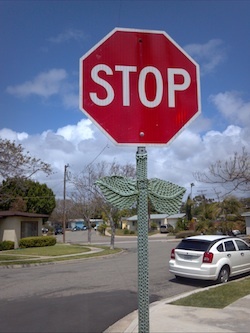 There are now almost 70 stop sign flowers across Clairemont. Just 31 more until all 100 are planted. Each one has its own page, and can be found on the map. Find the ones closest to you. You can place comments directly on each pole. Your comment can even include a picture of you next to the flower! As soon as it's dry the planting will resume! I've gotten a few requests to do their intersection. All of the poles have already been chosen. With over 60 to go, lots of Clairemont will have one nearby. I'm sorry if at the end your favorite pole wasn't transformed. There is now a map that shows all the current flowers! On the way to 100! As they are planted the map is updated. Keep an eye out for new flowers near you! The pieces are over 60% done. 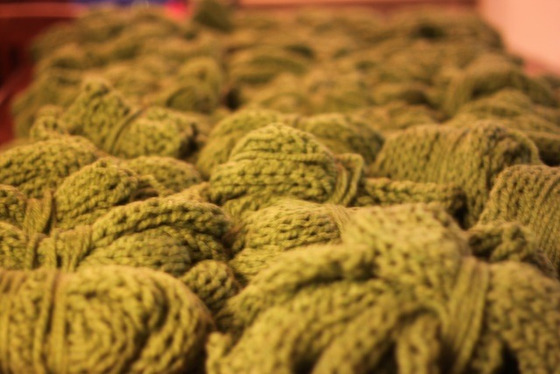 Thank you to all the knitters that contributed their time and talent! I wouldn't be this far without you. Now that the holidays are over I can ramp up again (and impose on some helpers! ), and at this pace start installing on March 1st. 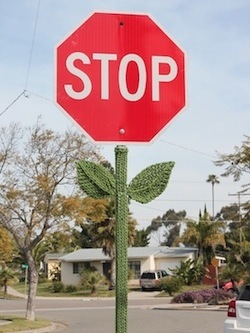 We should be done putting them up by mid March -- a celebration of spring as they spread across Clairemont. Bring size 35 needles if you have them. At Michaels you can get get them for under $5 with a 40% off coupon.